Are you looking for a way to get involved in the life of Ridgewood but aren’t able to commit to a regular gig? Would you like to bless the lives of people in our congregation and our community in their most vulnerable time as well as serve the church body during our events? Consider joining the Hospitality team! We are revamping our Hospitality Ministry and would love for you to be involved. We would like to invite you to a luncheon on Wednesday, April 17 from 12:30-2:00 pm where we will share our new vision. Sound interesting? Then join us! Please RSVP by Monday, April 15th so we have a count for the food and to determine childcare needs. *Children need to be fed prior to coming. 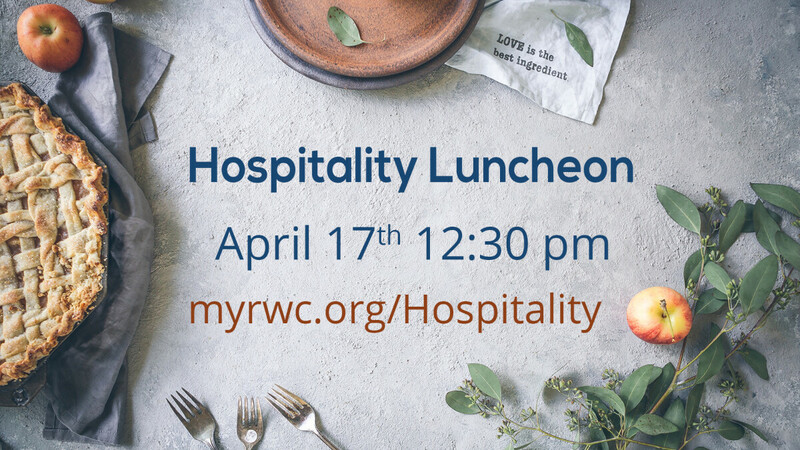 If you are unavailable to join us for the luncheon but are interested in hearing more about what the team does, just connect with Jill Horn at .